t*rexes and tiaras: Stick Man lives in the family tree..
"I'm Stick Man, that's me!" Spending a lot of my Christmas break with a rather small person meant that it fairly heavily featured Stick Man, to be honest. I'd seen the dramatization a year or so ago, and it, along with it's Gruffalo counterparts is a book I'm drawn to when I'm reading a story to a friend's little person, as there's something about the look of the books, and the stories which appeal to me. This particular Little is quite a fan of him and we'd look for suitable sticks to be Stick Man when we were out on woodland walks etc, as well as endless recollections of the story. 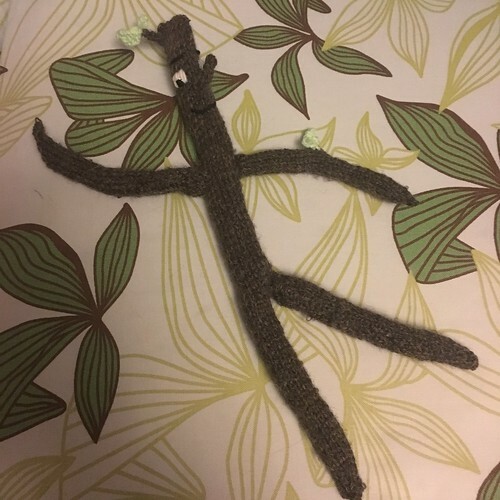 So, when I had a day at home and was feeling a little under the weather, I'd decided to have a go at knitting her a stick man of her own. I must begin by pointing out that I followed no pattern at all for this - the only stick man patterns I could find online seemed to be for crochet versions and that's something which I have just not quite managed to pick up, so I raided my basket of wool for something brown (this is one of the colours of the intarsia pattern on a vest which has been on pause for goodness-knows-how-long, because I am a terrible procrastinator and often put things down when they get a little too confusing or when I've forgotten what row I was on etc). But I didn't think I'd need all of it, so I got to work on a stick. 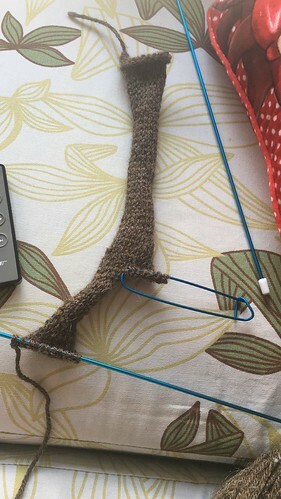 After casting on some stitches and making a kind of narrow rectangle, with the plan to stitch it together when I came to stuffing him, I basically just continued until I thought there was enough "body" section and added a few more stitches, split what I had into two and continued knitting the legs. 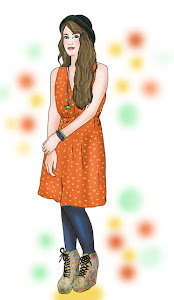 again, more trial and error until I decided that the proportions looked right. 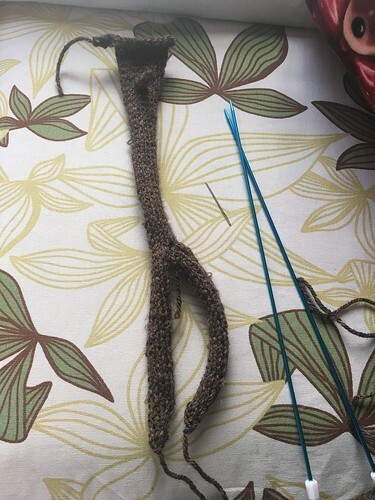 The arms were made in the same way, although separately and stitched up and on afterwards. 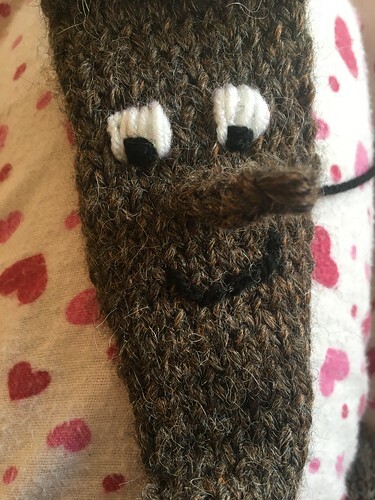 For the face, I knitted a nose and stitched it on, and the eyes, mouth and eyebrows were just stitched on with some scraps of yarn. I stuffed the body, legs and arms and stitched it up as I went, and added a few leaves on the head and one arm, to try and match the pictures in the books. I think this turned out quite well; basically I tend to be happy if someone can tell what something I've made it meant to be, and I think it was fairly evident that this was supposed to be Stick Man, so I guess I did okay. 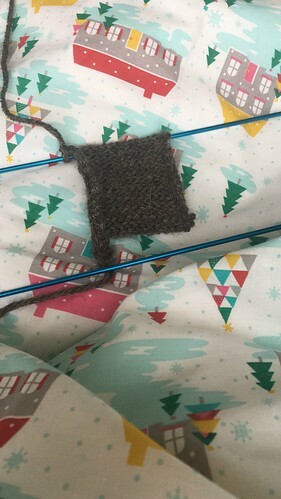 Apologies that I'm no expert when it comes to writing up the pattern or anything; it was literally just trial and error all the way. This is adorable!!! Clever you! 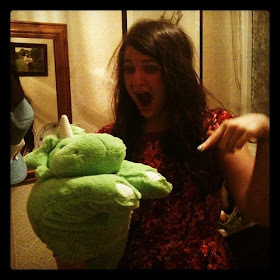 What a lovely grown-up you must be to this small person! And how nice to think of doing it! He definitely looks the part! This is so good! I bet the Little loved it. That is brilliant. Stick Man is one of my favourites too. I bet the little one was over the moon!